Peppy is just weird. She got her name because she looks a bit like a skunk and also just the way she’s always moving her head around. She’s very alert and can’t seem to sit still. She’ll be looking one direction then jerk her head the other way for a few seconds then do the same thing again and again. 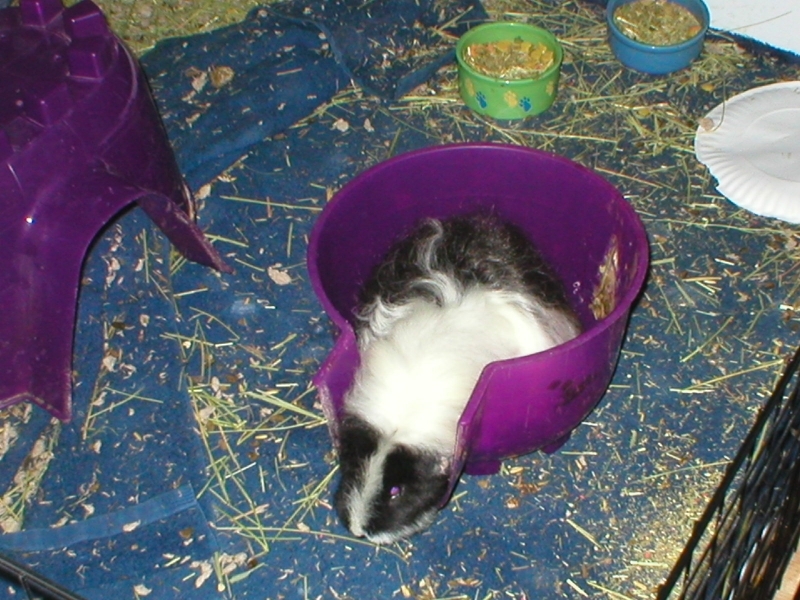 When she’s in her cage she is almost always in her pigloo. She usually moves it around while she’s inside to go where she wants to go. One in a while you’ll see her struggle to get it on top of the part of the water bottle she drinks from so that she can drink with out coming out side. It’s not unusual to find the food dish in there with her. She lifts up the igloo and then pulls the food in. She liked to be held but couldn’t sit still for 30 seconds. If Molly was holding her she’d climb up on her shoulder to nibble her ear. If she put her hood over here ear she’d get pissed off and go back and forth between ears and trying to push the hood out of the way.